When most heads think of The Emerald Cup, they conjure up images of some of the finest organic, sun-grown cannabis – swollen colas, dripping with trichs and terps, basking in another beautiful sunset, one day closer to a bountiful harvest. That makes sense as the event has grown over the past 16 years to become the largest and most respected outdoor cannabis competition and celebration on the planet. To be sure, the event revolves around the plant but there is no denying the importance of the human touch throughout the growth process and The Emerald Cup has become an authentic acknowledgement of the breeders and farmers who have quite literally put down the roots for the cannabis culture as we know it today. As The Emerald Cup continues to grow alongside this culture their mandate to maintain that grassroots authenticity stands strong. Founded by farmers, for farmers, the success of the Cup is measured not by revenue totals so much as by the feedback that Tim and the crew get from everyone involved with the event each year. So we thought it would be cool to catch up with one of the real OG’s from the Northern California cannabis scene for a fresh take on this growing tradition. Just coming off of a coast-to-coast speaking tour on the benefits and importance of regenerative cannabis cultivation, our friend Kevin Jodrey of Wonderland Nursery in Garberville, California was happy to give us his take on the state of the cannabis culture and on The Emerald Cup itself. Growing up in the late 1970’s and early 80’s exposed Kevin Jodrey to a rugged upbringing on the streets of Oakland Beach, Rhode Island. Days and nights full of fistfights and big money back-alley deals began at an early age for Jodrey who caught his first felony cannabis case in 1983 for cultivation and distribution when he was just a junior in high school. He knew the life he had chosen to lead, however, and the consequences were clear as day anytime Jodrey would take a ride after school to visit his friends who were doing hard time behind bars for weed. Times are certainly different now than they were back then when marijuana and anyone associated with it were demonized by a majority of a society that had been brainwashed by a successful decades-long smear campaign against the plant. This dichotomy between public perception (and the law of the land) versus what Jodrey knew about the plant and its many benefits from his own experience was difficult for him to reconcile but seeing too many friends getting caught up in serious trouble convinced Jodrey that he needed to make a change. By 1987, Jodrey’s change of scenery was complete. A long way from pushing pot in New England, he was now a highly skilled diver for the U.S. Coast Guard, often working drug trafficking interdiction cases alongside federal and local law enforcement off the coast of California. On one particular bust, Jodrey was dropped by helicopter down onto the deck of a boat being used for drug smuggling. Onboard, the suspects were comprised of a team of retired Canadian soldiers with the same set of skills that Jodrey had just displayed while apprehending the elusive group. While chatting with the wayward Canucks, they got into Jodrey’s head a bit by asking what his future plans were once his bid was up with Uncle Sam. When he mentioned a few mainstream careers that might utilize his military experience, the busted smugglers shot the idea down immediately. After a bit more discussion, Jodrey’s past relationship with the plant was revealed and his captives convinced him that weed was the way of the future, that legalization was imminent, and that he should consider cannabis as a future career path. In 1989, Jodrey had stepped out of the military and into a grow shop in Berkeley, California where he bought all of the lights and gear to re-spark his old flame. In 1991, he was summoned to Humboldt, California to do a consult and greenhouse install. He instantly fell in love with the region and has been there ever since. Although the Emerald Triangle 20-30 years ago had a much more weed-friendly atmosphere than his east coast stomping grounds, Jodrey clearly remembers the darker days of cultivating cannabis in NorCal and shudders when he sees Gov. Gavin Newsom vowing to revisit those failed tactics in 2019. Though prohibition and the fear of law enforcement created closer crews and tighter bonds, on a larger scale it has caused a deep separation in our society that widespread cannabis reform is just now beginning to bridge. In those early days, though, Jodrey and many old school heads like him were laying low and the last place that you’d find them was at a public cannabis festival. But something new was sprouting up in the mountains of Mendocino – a low key gathering of those in the know at a place called Area 101 where curious farmers from across the region would bring their season’s best to be judged against the rest. Though Jodrey did not attend those first few years of The Emerald Cup, he recalls stories of prize winners donning disguises masking all but their eyes as years of paranoia and anxiety slowly went up in smoke. His first visit to the Cup was the first year that the event relocated from Area 101 down to Garberville, where Jodrey’s Wonderland Nursery is now located, back in 2012. Urged by his friend and fellow Humboldt cannabis legend, Pearl Moon, Jodrey hooked up with Tim Blake on the farm one day and the rest, as they say, is history. 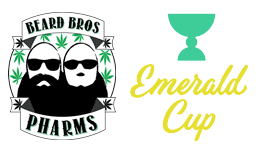 Jodrey has participated in The Emerald Cup as a judge, a speaker, and as a trusted voice of reason for event organizers to bounce ideas and plans off of as the Cup looks to expand its reach without sacrificing its authenticity. You might think that these accolades have earned Jodrey some sort of VIP status at The Emerald Cup, but as he says, everyone who walks through the gates at the Cup is treated like a VIP and they all have the same access to the experience as he does. As the cannabis culture grows and evolves, so too must The Emerald Cup. So Jodrey was glad to see some necessary changes made in the wake of Prop 64 to ensure that the competition and the tradition would remain accessible to as many dedicated cannabis farmers and product makers as possible. Last year’s event included categories for both “Licensed” and “Personal” entries since so many farms are still struggling to get greenlit by the state. The weed is great, but for Jodrey, The Emerald Cup is about the people he gets to see each year at the event that he may not get to see otherwise. Looking around last year’s Emerald Cup, Jodrey marveled at the diversity of the crowd as well as the diversity of the vendors and speakers, all of which inspired him. Seeing large name brands alongside mom and pop farms doesn’t bother Jodrey who sees it as inevitable. He is convinced that the market will dictate what is worthwhile and what is not and he leaves that judgement to others. Cannabis is a “truth serum” that “will cool you out no matter who you are” says Jodrey. He cautions the career culturalists who pass judgement on the new class of cannabis consumers and creators, demanding some sort of constant homage be paid for their time served during the dark days of cannabis prohibition. Today, Kevin Jodrey not only oversees the nation’s first modern vertical cannabis nursery at Wonderland, but he also runs licensed outdoor and mixed light operations, a retail storefront, and a thriving consultation business. His love affair with cannabis dates back more than four decades but, again, Jodrey sees the legacy of the plant as one of connectivity, and his highest priority is staying connected to the people he loves who in turn motivate him to help to carry on that legacy. “Cannabis invites all walks of life to get involved,” says Kevin Jodrey, and he invites you to the 2019 Emerald Cup this December in Santa Rosa, California.